Become a valuable volunteer today! English Springer Rescue America, Inc. (ESRA) is an all-volunteer 501(c)(3) non-profit charitable corporation. It is composed of rescuers, breeders, and owners. ESRA's nationwide endeavor to assist unwanted, abandoned, or abused English Springers is carried on by those with a love and passion for this breed. Membership is simple: make a pledge to help and support this rescue's efforts where and when you can. By pooling all member resources together, more dogs can be pulled from shelters, more owners with a sincere need to relinquish their dogs can be assisted, and more qualified homes will find dogs to adopt! 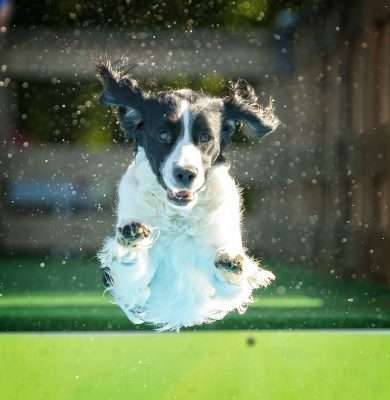 An incredibly high number of English Springers are found as impounds, abandoned or hurt and in need of medical care, or in deplorable living conditions where they are totally neglected by their owners. Thus, there is a real need for rescue, and ESRA will be grateful for your pledge of help. Rescued Springers are just as beautiful and loving as those more fortunate than themselves. ESRA is there for these dogs! Every attempt is made to put a needy dog into a safe, warm, and loving environment. The more helping hands that are united, the more dogs will be successfully cared for, rehabilitated, and placed in homes where they are truly wanted and loved. There are so many ways that members can help save Springers! There are 2 steps to complete. Please be sure to follow both steps. Please click here to open a new window to enter your application into our member management software. Then return here for Step 2. This form is for the Pledge and Code of Ethics and is different from the Member Application above. This will add your information to our Membership Pledge and Code of Ethics, then you will proceed to a new window to sign electronically. By use of this form, I consent to my submitted data being collected and stored.